Hardly any Scouters in the Northern Litchfield County Council noticed when Arthur Marston, executive of the Waterbury Council, died of a heart attack on Memorial day, 1935. Most volunteers in Northwest Connecticut were caught up in their own celebrations, and the fervor surrounding the Silver Jubilee. To those who did take note, it seemed like yet another of unfortunate events down the Naugatuck Valley. The Waterbury Council’s Camp, Sepunkum, was on government property in Mt. Tom State Park. As the park expanded under Governor Wilbur Cross' unique take on the New Deal, the council had to seek new camping facilities. With the Waterbury Council Executive’s death, the Region One Office in Boston started calling the shots. Before they approved a new executive, the regional office pressured the Waterbury Council to merge with the neighboring Naugatuck Council, which might also take care of the Naugatuck Council’s issues. As the new executive, the Regional Office proposed David Babson, executive of the Holyoke Council in Massachusetts. None of this seemed particularly important to the volunteers in the Northern Litchfield County Council. Perhaps they found it typical of a regional office that pressured them to dramatically expand in 1929, under the threat of dissolution. Overall, this was part of a larger trend in the BSA, of greater national involvement in local affairs. The National Council had spent most of the past fifteen years attempting to form local councils, to serve every troop in the county. Caught up in that campaign, they left most of the established councils alone. With that program accomplished, there was a growing concern about the independence some councils were asserting. In Region One, this was especially the apparent in the Narragansett Council, with its long tenured executive, J. Harold Williams. Williams offered his own take on the camping program and occasionlly mocked James West at professional development conferences. To replace David Babson in Holyoke, the Regional Office proposed the Northern Litchfield County Council’s own executive, Edward Jacot. Jacot had served as Council Executive for eight years, and as Scoutmaster of Troop 1 prior to that. He was one of three long-term Council Executives the Holyoke Council could choose from; they all offered experience, but their transfer would also ensure a degree of independence from the volunteers. 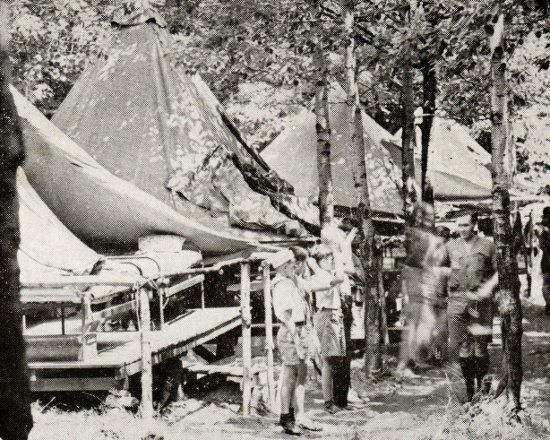 The image below shows Scouts assembled for tent inspection during the mid 1930s; Council Executive Palmer Liddle at right.